I’m always looking for new ways to decorate my home. Whether it’s switching out a piece of furniture for another, hanging new pictures, or changing paint colors, I always like to make things fresh and new every once in a while. Both of my boys have a lot of wall decals in their rooms, and I like that they’re easy to apply and easy to change up at a moments notice. I haven’t ventured into decals for the other rooms in my house until now, thanks to the great custom design I was able to create at WiseDecor. 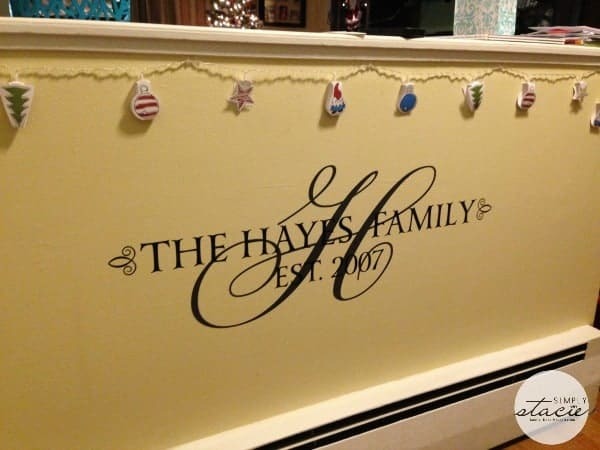 WiseDecor offered any of the wall decals from their site for review. At first I looked through some options that I thought might be nice for my boys bedrooms or playroom, but as I looked through the categories, I couldn’t help but think that I would like something for our main living space that represents our family. I absolutely loved the look of the Family Established Design and decided I had the perfect spot for this custom piece in my entryway. Customizing the piece is easy – you simply add in the name and date you want, choose your colors and size, and you’re done! You even get a custom live preview while you’re entering your info, so you’ll know exactly what your piece will look like before you add it to your cart. This piece is available in a 12″, 16″, and 22″ height – I opted for the 12″ which sells for $42.45. The piece arrive with detailed instructions on how to apply the lettering, and it even came with a small squeegee to help the process. 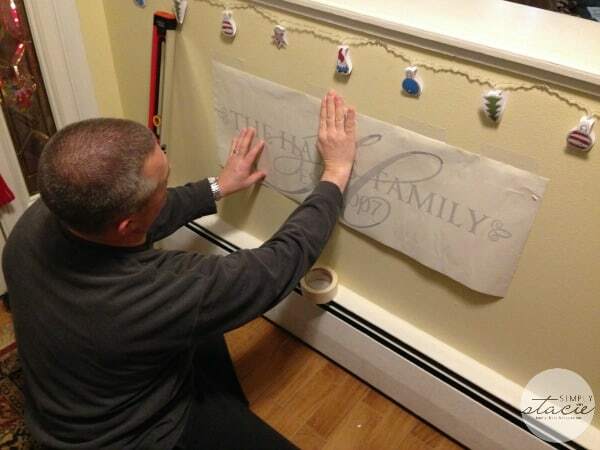 Once we wiped down the wall and prepped the piece by taping it where we wanted to apply it, my husband rubbed the backing of the paper to transfer the lettering. 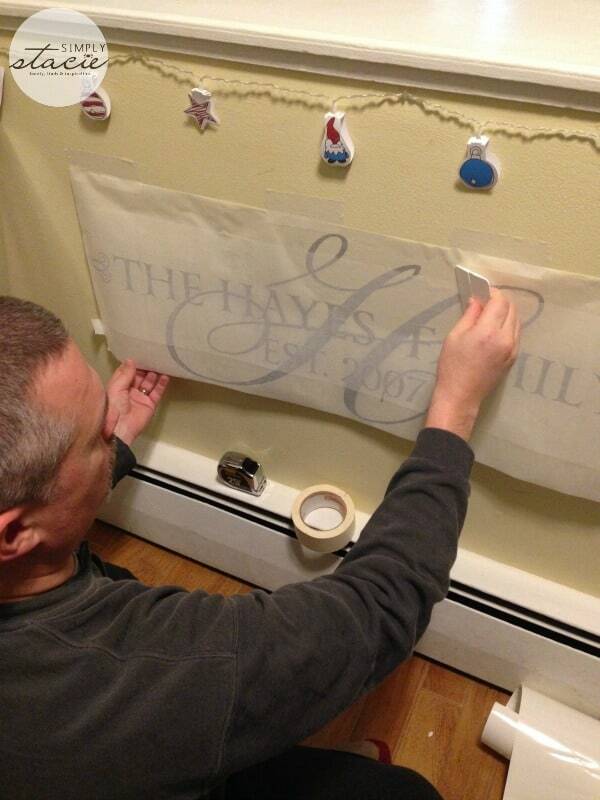 When he was done, he peeled off the paper backing to reveal the final product. I absolutely love how this piece looks in the entryway of my home. I think the colors work well with our wall color, and the size is the perfect fit for the space. WiseDecor offers a fresh and inexpensive way to decorate any room of your house. They offer endless options of customization – from quotes perfect for the kitchen to monogrammed letters for nurseries. Each decal they create is custom-made in their Greensboro, NC studio using a durable resin without any clear film around the designs, so they give the look of a painted-on stencil. You can check out their quote library by searching by room or type, or you can enter your own custom text for WiseDecor to create. Around since 2003, WiseDecor is a small family-owned business that strives to offer the best in customer service. They ship worldwide and offer a no-questions-asked money back guarantee. They’ll even send you a replacement decal at no cost if you somehow mess up the application process – how great is that! To see all that WiseDecor has to offer, check out their website. I really like the Flowering Tree Shelves Decal #2011080654. Love the Birdy Tree Shelf Decal! The house rules are great! I like this quote: I can resist everything except temptation. – Oscar Wilde. I like the “Five little Monkeys jumping on the bed One fell off and bumped his head Mama called the doctor & the doctor said No more Monkeys jumping on the bed.” nursery wall quote. I like the Little Flower School Library collection. I love the Birdy Tree Shelf Decal , this would be perfect for any baby’s room! I like the simple Welcome Door Vinyl. I think that would look great once my front door is painted. I would love to get lettering for a quote on my wall in my kitchen. Thanks for the giveaway! I like the Bon Appetit. I would like the Feel Love Be Love Give Love for over my bed. Thanks! “the dream that you wish will come true” for the kid’s room. Such an awesome phrase! I like the “Twinkle Twinkle Little Star” decal. I love the Pooh Nursery Theme Quotes especially the: If there ever comes a day when we can’t be together, keep me in your heart. I’ll stay there forever. ~Winnie the Pooh!